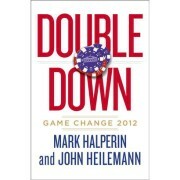 David is joined by author Mark Halperin and John Heilemann to talk about their latest book Double Down: Game Change 2012. This book is a comprehensive and unbiased account of the 2012 Presidential election and tells the tales that each side perhaps did not want to be told. This book serves as a bit of a sequel to their book Game Change which chronicled the 2008 election in much the same way.